Over the first year of life, your baby will sleep and nap a lot – from 12 to as many as 18 hours a day. The amount of sleep an infant gets at any one stretch of time is mostly ruled by hunger. Newborns will wake up and want to be fed about every three to four hours at first. 4 months old: Most babies begin to show some preferences for longer sleep at night. 6 months old: Many babies can go for six hours or more without the need to feed. As the baby grows, daytime naps will continue to decrease. A 2-month-old may nap up to four times a day, whereas an older infant may nap only one to two times a day. Where Should Our Newborn Sleep? Your newborn can sleep in a parent’s or sibling’s bedroom, or in the newborn’s own bedroom. The American Academy of Pediatrics’ Task Force on Sudden Infant Death Syndrome (SIDS) and the U.S. Consumer Product Safety Commission recommend not having your infant sleep with you in your bed due to the risk of suffocation, strangulation and SIDS. During the first 12 months, babies develop fast, and their sleep patterns change rapidly. It is also important to understand that all babies briefly awaken several times a night. Some babies are able to soothe themselves back to sleep. Other babies learn to signal their parents for help (i.e. rocking, holding, cuddling) to settle them back to sleep. 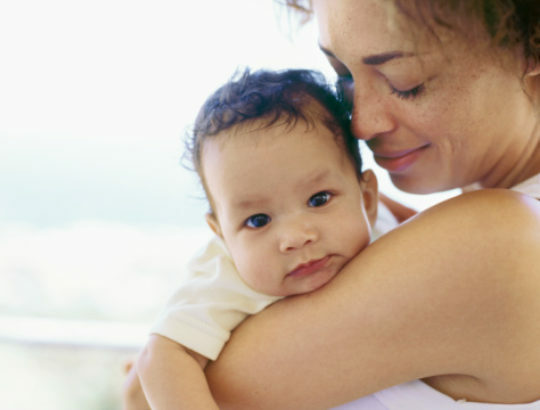 However, it is best to let the newborn comfort him or herself back to sleep rather than develop a need or association with a parent or guardian. Work on shifting your baby’s sleep cycle more toward nighttime by 2-3 months of age. Newborns frequently have their days and nights reversed, and often the awake/sleep cycle is governed by the need to feed. When there is a need to feed during the night, keep lights dim and reserve stimulating interaction for the daytime hours. Learn to understand signals that your baby is getting tired. Signs of being tired differ among babies, but can include things like becoming fussy, crying, tugging on body parts, yawning and rubbing eyes. Most experts recommend putting your baby to bed while he or she is still awake but drowsy. Your baby can respond well to such near-bedtime rituals as bathing, rocking, reading and a gentle massage. Avoid making bedtime feedings part of the bedtime routine after about 6 months of age. Try to introduce a security object (i.e. a stuffed animal or blanket) around the age of 1 year. Also, make sure the bedroom environment is quiet, cool, dark and comfortable for sleeping. Do not be surprised to see a lot of body movement as your baby sleeps. Your child may sound like he or she is awake, but actually is not. You’ll see smiling, sucking, twitching, jerking and all kinds of motions – these are all normal aspects of sleep. However, if he or she continues to cry for several minutes, it is time to check on him or her.